We arrived in Bali late evening on a Malaysia Airlines flight from Kuala Lumpur. The Ngurah Rai international airport is located in Denpasar, on the southern tip of Bali and close to the major beach and resort destinations of Jimbaran, Kuta and Nusa Dua. This was the first time I had travelled by Malaysia Airlines, and I found the experience a good one on all counts: professionalism, service and in-flight food. The airport is not a glass and steel structure; you see wooden fixtures, intricate carvings, stone sculptures, etc. The entire process of getting a visa on arrival, immigration and customs took less than 30 mins. 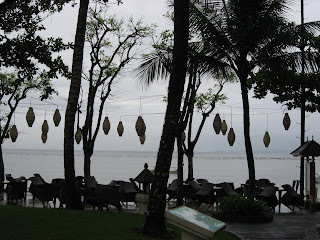 Our resort was in Nusa Dua, on the southern-most tip of Bali; this area has been developed relatively recently, relatively more secure, and home to some of the upscale resorts and hotels. We were welcomed into our hotel with sounds of exotic musical instruments and two Balinese girls doing traditional dance moves in bright costumes at the entrance. Magnolia trees all around were in full bloom. Our magical vacation on Bali had begun! Both magical and mythical, this land of volcanic lakes, spectacular rice terraces, stunning tropical beaches, ancient temples and palaces is an exotic melting pot of cultures and peoples. Renowned for its architecture, traditional theatre, dance and elaborate religious festivals, the colorful Balinese culture is constantly synthesizing the old and the new, the traditional and the innovative. There has been considerable effort put into making this a prime tourist destination. All the high-end hotels have a presence here and more seem to be coming in every year. The airport has a nice ambience, friendly staff, and a good collection of duty-free and food outlets. I noticed that the roads are better than in most Indian cities. All this goes a long way in making your vacation experience one to remember. There are temples everywhere. However, they are quite different from the Hindu temples in India. The temples are almost always black in color and have a distinct architecture. The idols and sculptures of the gods (Garuda, Ganesha, Vishnu) look different from the ones in India; some have very fierce expressions and look warrior-like. 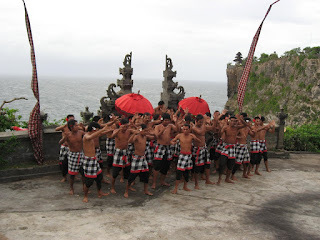 Visitors have to cover their legs before entering a temple; most temples will provide a sarong and sash for this purpose. However, you can wear your shoes inside (unlike Indian temples). We also visited Kuta, the place where all the nightspots are located; this is a good place to shop, eat out and walk around. We bought some handicrafts and souvenirs here. I was intrigued by the figurines of Garuda, which is also the mascot and name of the Indonesian airline. 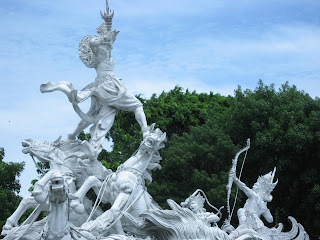 For more info on the mythology of Garuda, go here. There are places we could not visit: The 'mother temple' at Besakih, the active volcano at Batur Caldera, and the hot springs near Lovina on the northern coast. 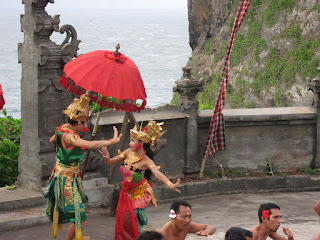 But even with the brief time we spent at Bali, we carry back lovely memories of this Island of the Gods! Some tips for new travellers: Keep US $10 per pax in cash ready if you intend to get a visa on arrival. Also, keep local currency worth 10, 000 rupiah(approx US $10) per pax for exit tax which has to be paid after checking and before boarding.